If there’s one thing bed sheets are lacking in the shops, it’s choice in colour. 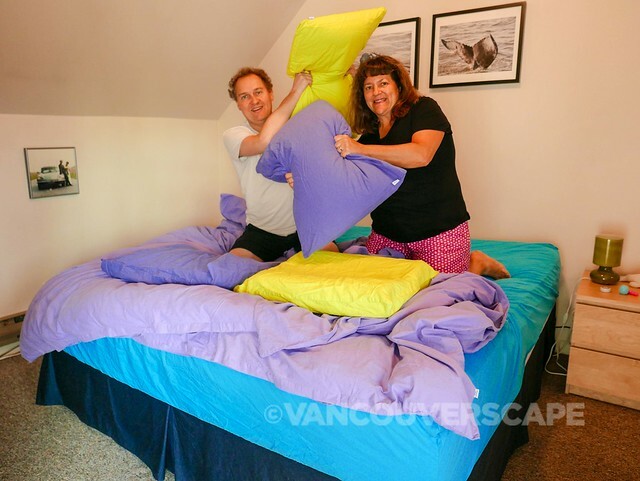 When we outfitted our king bed last year, we shopped at Ed’s Linens on Granville Street. 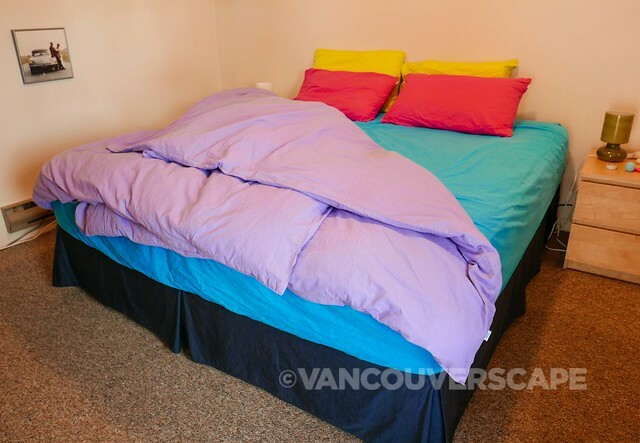 With a former location on West Broadway in Kitsilano, this shop offers the usual bland colour range of sheets, pillow cases, duvets and the like. 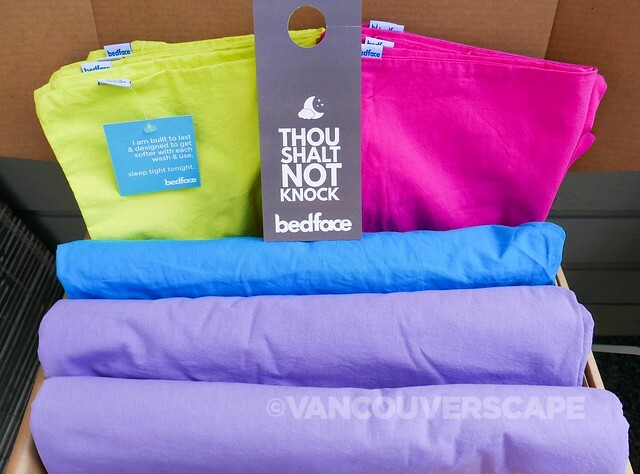 Lucky for us, we recently discovered Vancouver-based bedface, an online cotton sheet store with a gorgeous range of 24 colours for mixing and matching your bed set. You can select from their Super Sleet Sets or get creative using the realtime Bed Maker. Since we don’t sleep with a flat sheet, we opted for a custom-built Sleep Set. The sheets and pillowcases are made from long-staple, breathable 100% cotton, meant to last without pilling or tearing. They’re pre-washed and have a matte finish with a bit of texture. As well, all colours can be washed together in the same load. 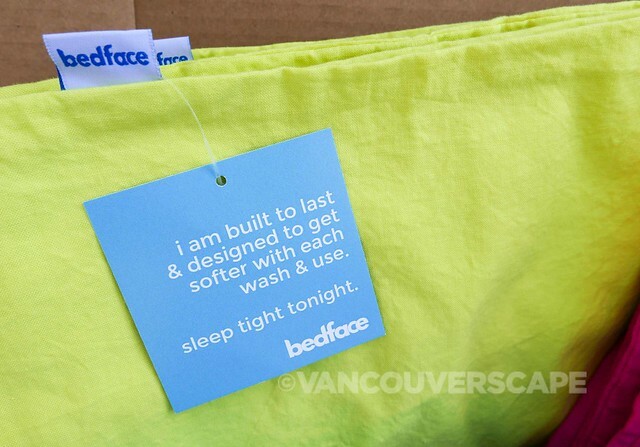 bedface has cute little labels on all their products too, the handiest being the fitted sheet with a label on the bottom right so you’ll always put the sheet on the correct corner of your bed. We’re always interested in showcasing local companies, and I was curious as to whether their fitted sheet would fit on a mattress with a pillow top, so we decided to contact their team and see how we could outfit our bed in a full range of colour and do away with our boring old white, navy and light blue bedding. Once you’ve selected your bed and pillow size in the Bed Maker, it’s time to click on the Duvet Cover, Flat Sheet, Fitted Sheet and Pillowcase options to build a picture right on your screen. There’s a couple of entertaining extras (“I Love”) for adding cats, dogs, sheep or bears to your scenario (the fun continues when you add a background). 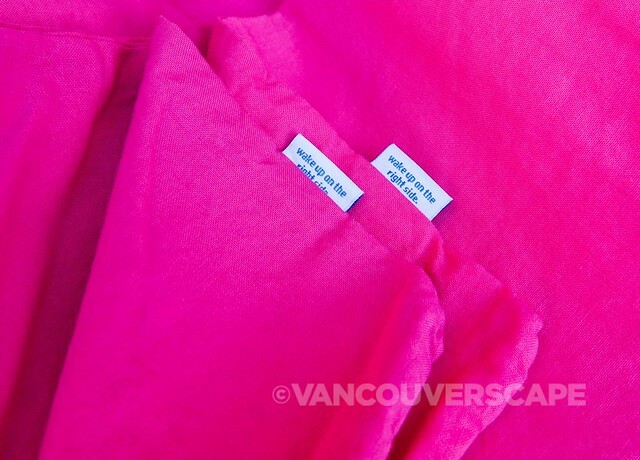 Any sold-out colours will show up as you make selections, helping to avoid disappointment. It was hard for us to choose from so many cool colours but we finally arrived at a decision. And luckily the colour choices were available in the sizes we needed. You’ll notice TWO duvets on our bed in Dreamy Violet. Here’s where I bring up the best tip for keeping a marriage together: separate duvets! We’ve had separate duvets for ages in all the places we’ve lived since we’ve been together and it means freedom from your partner pulling the duvet over to their side (and vice-versa). What sets bedface apart from many online retailers is being able to create your own pieces without committing to a standard set of sizes. We ordered two matching, marriage-saving twin duvets, a king fitted sheet and standard pillowcases. 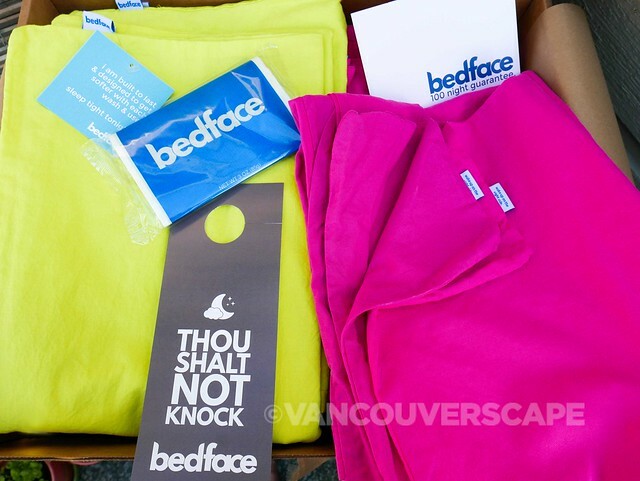 This might make for a complex online order for many stores, but no problem for the folks at bedface. bedface charges a $9 flat shipping rate; your bed set will arrive in between three and six days (up to 10 for international orders for a $19 flat rate). A bonus: you won’t have to pay duties and taxes upon delivery, something we can attest to being a royal pain when it happens on our end. Our box (delivered pretty quickly as we’re local) opens to reveal a blast of colour. A cheeky microwave popcorn and a Do Not Disturb sign are thrown in for good measure. We love some of the names given the colours too: Dreamy Violet, Citron, Electric Pink, Alarm Clock Orange, Twilight. The sheets are a little rougher than what we’re accustomed to (high thread count Egyptian cotton) and are meant to soften with wear and future washings. All products come with a 100 Night Guarantee. They can be returned for a full refund if you’re not happy, even after washing and sleeping on them for 100 nights. This is an amazing guarantee: most stores in town won’t allow returns unless the bedding is still in its packaging. As if we hadn’t already looked forward to hitting the sack, our new colourful sheets are stylish, comfortable and lively. We’re done with boring white, navy and powder blue, and are going Citron, Electric Pink, Sky Blue and Dreamy Violet from now on.